Even though there is a high risk of damage caused by rpz flooding, plumbing engineers still routinely design and install reduced pressure zone backflow preventers insided. We've learned about these risks, by studying flow rate charts from backflow manufacturers such as Watts and Wilkins. We've seen the water dumping firsthand and filmed it in our video on RPZ failures. There are even flood control valves available to combat this known hazard to a business and it's owner. But that isn't what we're here to talk about today. 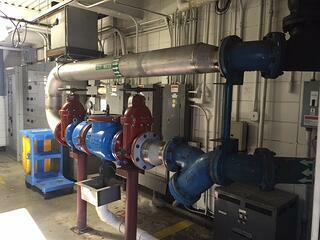 There is another downside to indoor backflow preventer installation. This one is always there. It comes with the device and doesn't need any sort of valve failure to cause problems. Let's talk about how much money a property owner stands to lose just by having a backflow preventer installed inside their building. How Much Space is Lost? The size of one of these devices may come as a surprise to property owners. For example, I've calculated that the space needed for the smallest flange-sized RPZ valve - 3" - would need at least 33 square feet of space. This is apparently very modest, however. As I've presented this argument at events held by ASPE and ABPA chapters across the country, the attendees have repeatedly told me that this is absolutely not enough space for a 3" device. Plans reviewers, architects, and design engineers I've spoken with all agree that 33 square feet would most likely not be enough. So, it turns out that number is the absolute smallest possible space lost from an indoor backflow preventer installation. Remember, that is also one of the smallest assemblies. Double check and RPZ backflow preventers installed inside are often 4"-8". It's common to see an 8" DCDA for a fire line and a 4" RP for a domestic line side by side in a mechanical room. Some architects I've spoken with say the most common complaint they hear from plans reviewers is that there is not enough room for the backflow preventer. 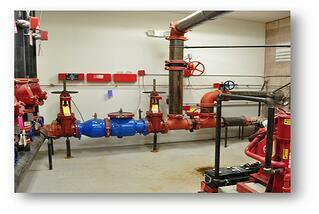 These rooms have to be large, because the amount of space required for a backflow device grows exponentially. The required space for a 6" RPZ can be up to four times as large compared to a 3" RP. The same goes for DC and DCDA backflow preventers. Mechanical rooms with backflow preventers inside are not small closets the way you might imagine them. In addition to the space required for the assembly, most building codes specify clearance distances around the assemblies so that maintenance, testing, and repair may be performed efficiently. When the architect moves the assembly outside to a suitable protective enclosure, they get all that space (the space for the assembly and the space for suitable clearances) back as rentable square footage. This is one reason the trend in backflow installation is to move them outside. Read more here. Returning to the 33 square feet number, we can calculate how much money a property owner would lose over 25 years. Assuming a discount rate of 9%, a rent value of $30 per square foot annually, and a 25 year life, the net present value of that space is $12,156. You probably don't even want to think about how much money would be lost if that 3" RPZ backflow preventer was a 6" one instead. So we'll stick with the smallest possible scenario, and the smallest possible loss. To compare, now we need to know how much installing a backflow preventer outside would cost. The cost of the device and a protective enclosure for it must be less than $12,156 for it to be worth installing outside instead of inside. We include the enclosure because the device will need freeze protection, as well as protection from from vandals and accidents. 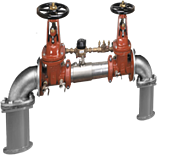 A couple of the most common RPZ backflow preventers are the Watts 957 NRS and Watts 957N NRS. Both are pictured to the right. An enclosure for the traditional larger device costs $3,266 and for the N-type the enclosure is $1,100. Each would need a concrete pad for $1,200 and $1,000 respectively. They would also need $1,800 each for running electricity for the heater inside. The brings the total for the larger 957 NRS to $6,266 and the smaller N-type would be $3,920. This means that if the building owner has an N-type RPZ backflow preventer installed in a heated enclosure outside, they would save $8,236 over time. Saving that much money means the owner is extremely motivated to keep all backflow preventer installation outside their buildings. Don't forget we used the smallest possible device and those in the industry agree that 33 square feet is not even large enough to pass most plans review teams. Additionally, there are a few scenarios that compound this cost differential. One is the likelihood that either of two future events will require a DC assembly to be upgraded to an RPZ - an outcome that is becoming quite common, and will cost the owner thousands of dollars in retrofit expense plus the continued lost opportunity cost from an over sized mechanical room. This happens either when the tenancy changes from low hazard to high hazard through the normal leasing and re-leasing process; or the purveyor changes its definition of what constitutes "high hazard" and now your low hazard user will be re-classified as a high hazard user. This is all, once again, in addition to the risk of RPZ flooding that can cost much more and include downtime for the business. As a building owner, architect, or design engineer this aspect of the building design is typically overlooked. The same design thought used over and over again deserves consideration. Move the device outside to save the money, eliminate design risk associated with the risk of an RPZ flood, and save the owner the hassle of dealing with an RPZ flood.